Dr. Gilbert McKenna (Robert Clarke) is a boozy atomic scientist who is accidentally exposed to a new kind of radiation. He’s taken to a hospital but seems to suffer no ill effect… that is until he’s exposed to sunlight. Sunlight causes Gilbert’s body to devolve, turning him into a lizard man, just like all the science books say we came from. What follows is sort of a reverse werewolf story with the sun transforming Gil. Lizard-Gil goes out and kills people then reverts to human and gets drunk. He eventually comes up against his arch nemesis, an oil rig. This movie has its share of flaws, mostly being pacing issues in the middle of the story and a main character who is kind of a jerk. But director and star, Robert Clarke put a lot of work into the film and it shows. The monster suit looks good and has a couple of great scare scenes. 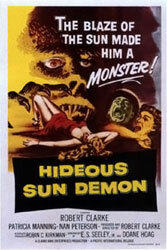 ‘Hideous Sun Demon’ was made away from the studios which allowed it to push the boundaries a little bit; an alcoholic main character, the monster killing a rat and a dog, and a bit more innuendo than you expect from something made in 1959. It's a fun atomic horror movie.